​Michael Keough is a 2009 graduate of the University of Massachusetts Amherst where he earned bachelors degrees in Music Education and Trumpet Performance. While at the University, Michael studied trumpet with Eric Berlin and arranging with Michael Klesch. 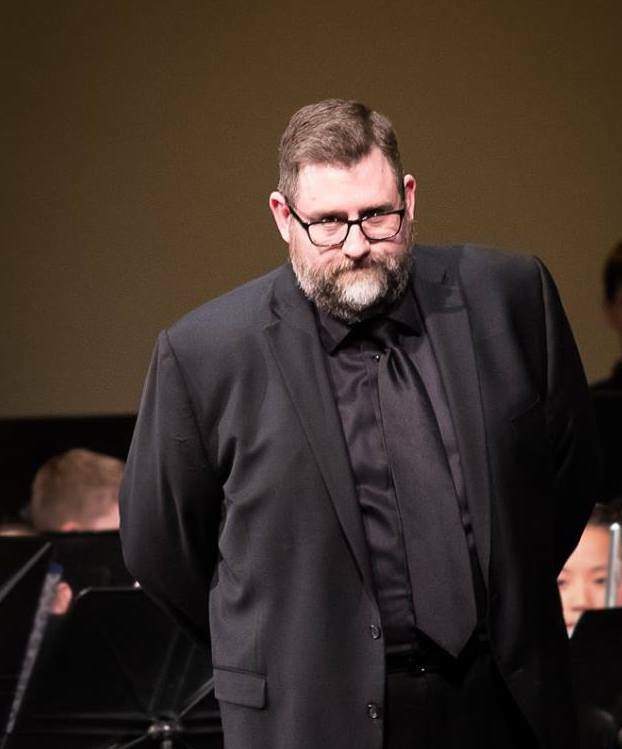 Michael served as principal trumpet in the Wind Ensemble, lead trumpet in Jazz Ensemble I, and Student Director of the 400-member Minuteman Marching Band. Michael is the band director at King Philip Regional High School where he directs the Concert Band, Symphony Band, Jazz Ensemble, and the King Philip Regional High School “Pride and the Passion” Marching Band. Prior to working at the high school Michael was the band director at King Philip Middle School. Under his direction the 7th and 8th grade concert bands consistently earned gold medals at the Massachusetts Instrumental Choral Conductors Association Concert Festival performed at Boston’s Symphony Hall. In addition to arranging for the King Philip Regional High School Marching Band, Michael’s arrangements have been performed by the UMass Minuteman Marching Band, UMass Hoop Band, UMass Jazz Ensemble I, UMass Studio Orchestra, Chelmsford High School Studio Orchestra, and Metropolitan Wind Symphony. In his free time Michael enjoys running, cycling, and remodeling his home. Ashley Nelson is a choral director, guest conductor and clinician living in the greater Boston area. She holds a master’s degree in music education from Boston University’s College of Fine Arts has always taken an active part in MA music education and festival organizations, currently serving as Membership Chair for the Massachusetts’ chapter of the American Choral Directors Association. Ashley has been the successful director of many public school choirs during her career and currently directs the choral program at King Philip Regional High school in Wrentham, MA, as well as the Charles River Chorale, based in Millis, MA. ​Additionally, Ashley is a composer and arranger of choral works, several published by Santa Barbara Music Publishing, Inc. She also enjoys her private studio of voice, piano, and music theory students. I am excited to start my sixth year as General Music and Chorus Educator at King Philip Regional Middle School. In addition to my teaching duties at King Philip, I run the school's Select Honor Chorus and music direct the Drama Club's Spring Musical. This past summer I completed my M.Ed. in School Leadership from Endicott College. Before teaching at King Philip, I served as Music Director and Fine Arts Department Chair at a private high school in Pawtucket, RI. Joshua O. Wolloff began teaching at King Philip Middle School in 1996. His responsibilities included 7th and 8th Grade Bands, 7th and 8th Grade Chorus, and Middle School Jazz Ensemble. He was also the Woodwind Instructor and Assistant Director of the King Philip Regional High School “Pride and Passion” Marching Band. In 2010 Mr. Wolloff became the Music Director at King Philip Regional High School where he taught Concert and Symphony Band, Chorus, Music Theory, Jazz Improvisation, Instrumental Techniques, Introduction to American Popular Music, Introduction to Piano, Introduction to Guitar. He was also the Director of the “Pride and Passion” Marching Band and the High School Jazz Ensemble. Under his direction performing ensembles at the Middle School and High School have consistently earned Gold Medals at the MICCA Concert and Choral Festival earning the opportunity to perform at Symphony Hall in Boston, the MICCA Marching Band State Finals, the MAJE State Jazz Festival and the Marching Band earned USBands National Championship in 2012, 2013, 2015 and 2016. Mr. Wolloff returned to the King Philip Middle School in the 2017-2018 school year. Mr. Wolloff graduated from the University of Massachusetts Amherst where he earned his Bachelors Degree in Music Education and studied Saxophone with Lynn Klock. While at the University Mr. Wolloff played Saxophone and Bass Clarinet in the Symphony Band and Wind Ensemble under the direction of Malcolm Rowell, and Alto and Baritone Saxophone, Flute, Clarinet and Bass Clarinet in Chapel Jazz and University Jazz Ensemble under the direction of Chris Merz and David Sporny. Mr. Wolloff holds a masters degree in Education from Cambridge College. Outside of school Mr. Wolloff enjoys photography, cooking and spending time with his family.